With the exception of more Wander games (which I will rotate back to) I am technically done with 1978 for the All the Adventures project. I will be diving into 1979 soon, but I did find some versions of Adventure from 1977/1978 I missed for various reasons. In two cases I had compilation issues and in one case I can’t find any related files. Can anyone help? Jim Gillogly, 350 points, 1977. A literal port into C. Given there are no changes I can skip this one. David Long, 501 points, 1978. Fortran IV source is available, but nobody seems to have compiled it due to it being not compatible with modern Fortran. Gordon Letwin, 350 points, available by August 1978. This was apparently not a literal port as (for instance) Carolyn VanEseltine reports remembering “an African gray parrot in a pirate aviary, accessible by a rubber raft”. It was available on the Heath personal computer as opposed to a mainframe. 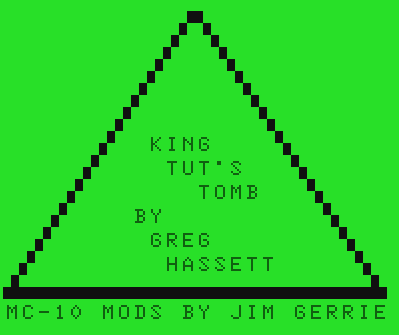 I took the map I already had from Greg Hassett’s game King Tut’s Tomb, used Trizbort’s feature to export source, and made a “game” out of it, but “dadaist art experiment” might be more accurate. Greg Hassett has already graced this blog in Journey to the Center of the Earth Adventure and House of the Seven Gables. The former felt incomplete and had only one real puzzle, and the latter had a few more puzzles but was still a goofy pastiche. They held in common a highly tenuous relationship with a work of literature (essentially just ripping off the title). 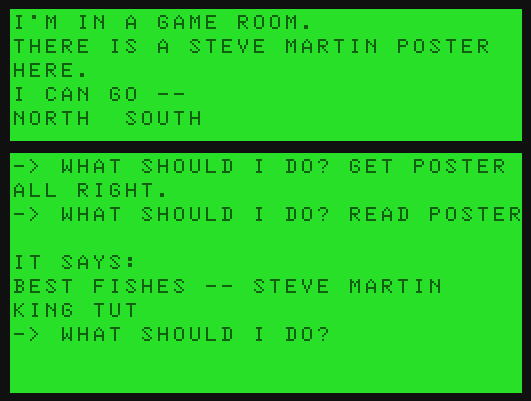 It is clear the author meant this because there is a Steve Martin poster in one of the very first rooms. So, the gameplay, such as it is, involves plundering treasures from a tomb 19th century archaeologist style. There are nearly no obstacles; it’s grab, tote-to-entrance, and drop. AN ANCIENT MUMMY WALKED IN TO TERMINATE ME! THE MUMMY BURNS TO THE GROUND. …and a snake that can be tamed with food. As far as I can tell from studying the source, a 100% score is impossible, but erratic scoring would not be unusual for a Greg Hassett game. That’s a wrap! There is almost nothing I can think of to say here, unless I wanted to compare the reckless cultural plundering of this game to the majority of grab-the-treasure adventure games. So, I made something extra which I’ll post about in a moment! So there was indeed one last treasure, and finding it was interesting, but unfortunately when the endgame triggers the game crashes. A glance through the code indicates the endgame is identical to 350-point Adventure, so I’m safe to call this one done. The giant turned out to be the key, and the puzzle made clever re-use of something in a way that I was hoping I’d see — sort of an overlap of the original structure creating something new. If you walk into the room with the giant carrying food, he’ll eat the food but complain it is too tiny (but at least not eat you instead). I admit I racked my brain on this one for a long time while missing the obvious, which you’ll see if you study this partial list of the treasures of the game. THERE ARE RARE SPICES HERE! THERE IS A JEWEL-ENCRUSTED TRIDENT HERE! OFF TO ONE SIDE LIES A GLISTENING PEARL! A SMALL VELVET PILLOW LIES ON THE FLOOR. THERE IS A LARGE NEST HERE, FULL OF GOLDEN EGGS! THERE IS A PLATINUM PYRAMID HERE, 8 INCHES ON A SIDE! THERE IS A PERSIAN RUG SPREAD OUT ON THE FLOOR! THERE IS PRECIOUS JEWELRY HERE! THERE ARE BARS OF SILVER HERE! The golden eggs! While they have the nice property of regenerating (allowing them to be used to placate the troll) I somehow never thought of them as a food item, but I can see why a giant might include them in their diet. THE GIANT DRAWLS, AND GRABS THE EGGS LEAVING YOU SHAKEN BUT UNHARMED. The giant leaving you alone gives access to a new passage, which leads to (unfortunately) another maze. I lacked the energy to map the entirety of it but fortunately you don’t need to in order to find the important room. A LARGE UNTIDY SPIDER’S WEB COVERS ONE CORNER OF THE CAVE. A HUGE BLACK HAIRY SPIDER CROUCHES IN ONE CORNER OF THE WEB. The spider presented the second (and apparently, only other) new puzzle of Adventure II. YOUR LAMP IS NOW OFF. A DISTANT OWL CALLS “HOOT”. After defeating the spider you find some documents in the web, which upon bringing them to the giant (unavoidable since you have to go back that way) he’ll give you a ruby for the documents. The ruby was the last treasure I was missing. For a long time adventure games seemed to try very hard to avoid simulation elements, with the few experiments that embraced it (like Disch’s Amnesia) considered cautionary tales rather than models to emulate. Only recently has this been starting to change (see Onaar and Gotomomi from this year’s IFComp). I think there’s a lot of unexplored territory here to explore. 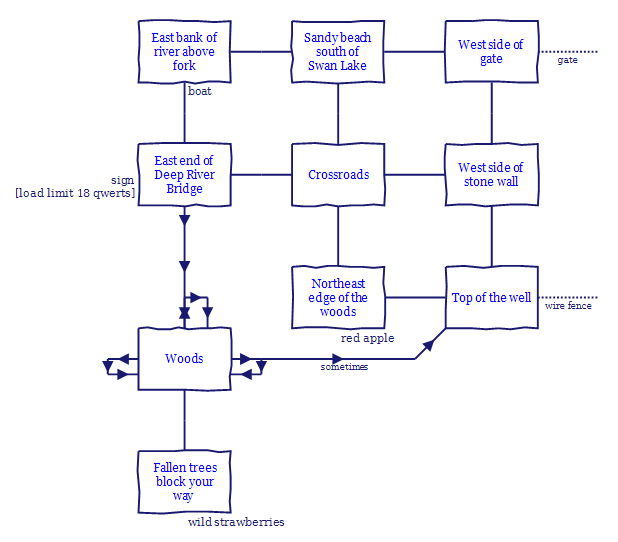 Despite the annoyances I found it interesting when working from a walkthrough (made by myself, recall) but having to improvise anyway; for example, at one point the pirate stole treasure I meant to deliver in such a place that a different route than I had previously written became more efficient (given how tight the lamp timer is, I needed all the efficiency I could get). This sort of flexible thinking might go part of the way to removing the static-set-piece feel a lot of IF has. While I found Adventure II interesting to write about I unfortunately cannot recommend it as an experience to others. There’s just wasn’t enough novelty to justify the effort, and the balanced experience of 350-point Adventure (still a good game) felt reduced rather than augmented. 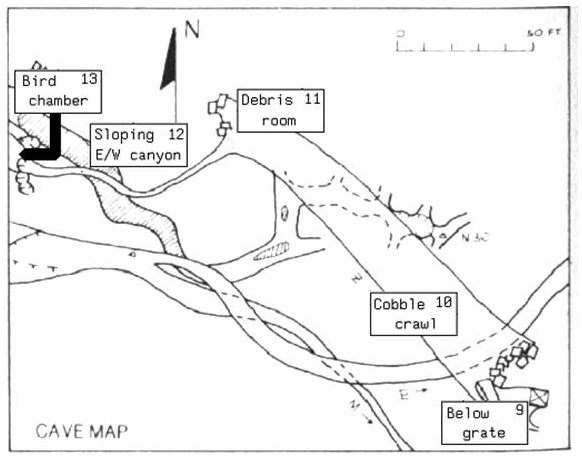 Part of Will and Pat Crowther’s actual map of Colossal Cave, with game map locations superimposed. From Dennis Jerz.